Yes. I ate lunch in my usual Penn Station hangout. Why not? No one seems to mind that it takes me FOREVER to finish my coffee and meal. They don’t notice that I rest iPat on top of my book and sketch or check out Facebook. I think it worked out ok that I decided not to take my usual spot. After lunch in the train station I rode the #1 subway to the very last stop, South Ferry, the downtown tippy tip of Manhattan, and walked the few blocks to the National Museum of the American Indian. Admission is free and security was quite stringent. My purse went through the scanner. Keys, change, iTouch, coat and even hoodie went into a basket. I forgot to take my cheapo phone out of my jeans pocket before I went through the scanner – BEEP!!! – and you should have seen the guards jump towards me, ready to tackle. Yikes. Entertaining. The same guard who was going to “take me down” then helpfully explained the layout of the museum, directed me to the particular exhibit I was interested in and informed me about additional contemporary art and prints in other galleries. Ohhhhh. What a marvelous museum. I was stricken speechless. I had no idea this work existed. Shame on me. The art of George Morrison triggered idea after idea as I examined each piece with a stupid grin on my face. I returned to the first gallery, planning to sketch, but there was no time. I figured I would just zip through the rest of the museum but I was knocked silly by the prints in one hallway – monotypes and lithographs – oh be still my heart. Then I passed into the gallery with the artifacts and glanced right and left as I walked (wow) and found myself in another room with more contemporary art. Slowed me right down. But. Gotta go. No more time. I’ll return when Benedicte is back from France. 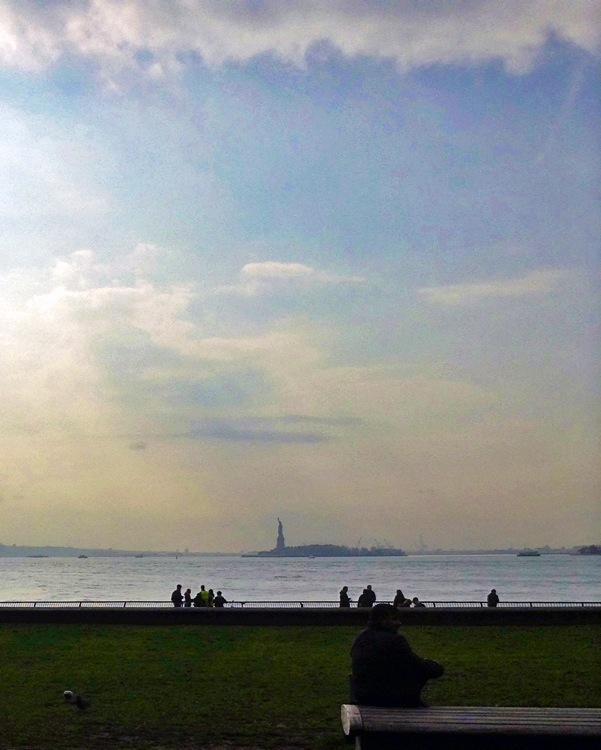 I walked north up to South Cove along the Hudson River. Do you see her? 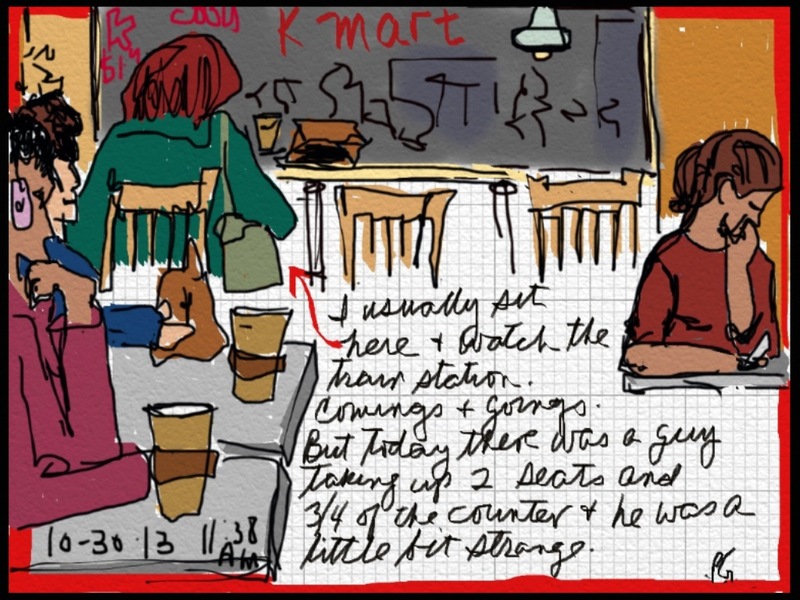 iPad, Sketch Block (drawing, color, text) & ArtRage (for rough background only); New Trent Arcadia stylus. photo taken with iPod Touch (tried to fix it up in Photoshop Elements but you get the idea).